When you are first getting into DC Comics, you learn all the main regulars pretty quickly. There is Superman, Batman, the Flash, Green Lantern, and Wonder Woman. They all have had comic book series about them for quite some time now. Most of us can even tell you the backstory about the characters as well. They are the original main staples of the DC universe. But then one day, you are reading a comic or looking at it on the shelf and you notice there is a superhero that you can’t quite place. He seems to be a bit of a rip-off of Superman, except that he wears red, white, and yellow instead. Same dark hair and chiseled body, too. And look, he can even fly and he has super strength as well. Did you just step into a parallel universe where Superman has been replaced with this guy? It may feel like it, but the answer is no. The superhero formerly known as Captain Marvel was created by artist C. C. Beck and writer Bill Parker in 1939. Superman was created by teenagers Jerry Siegel and Joe Shuster in Cleveland, Ohio, in 1933. The two sold Superman to Detective Comics, the future DC Comics, in 1938. This is when the whole world seemed to have quickly discovered Superman all at once as the character’s popularity grew by the day. Captain Marvel was actually the alter ego of a boy named Billy Batson. Billy was an orphan that had great powers bestowed upon him whenever he would say the magical word “Shazam”. Shazam was an acronym based upon the gods that Billy would acquire his powers from. There was Solomon, Hercules, Atlas, Zeus, Achilles, and Mercury. This meant that the superhero Captain Marvel had powers that were almost identical to Superman. What many people do not know is that Captain Marvel grew so much in popularity that the book sales show that it outsold Superman comics during the 1940s. The future was looking very bright for Captain Marvel. But DC Comics had something else in mind. They filed a copyright infringement suit against Fawcett Comics, the publisher of Captain Marvel. DC said that Captain Marvel was a direct copy of Superman. With Captain Marvel coming out a year after Superman had become a global phenomenon, it is hard to argue with DC. In 1953, Fawcett Comics quit publishing Captain Marvel after going back and forth in lawsuits with DC. Plus, the comic book industry was hitting a low, so there were not many sales happening during this time. This could have been the end of Captain Marvel, but almost 20 years later in 1972, DC contacted Fawcett and asked to license Captain Marvel and the rest of the Marvel family like Mary Marvel and Captain Marvel Junior. The comic books industry was in the midst of a boom, and DC felt Captain Marvel would be a great addition to their universe. In 1991, DC had finally acquired all the rights to the character. However, there were confusing days ahead. Even though the character’s name was Captain Marvel, many kids such as me believed the superhero’s name was Shazam. The comic book was called “Shazam!” and it was all confusing to my little kid brain. Plus, to complicate matters even more, DC’s arch rival in the comic book industry, Marvel Comics, had created another superhero named Captain Marvel. Marvel Comics and DC Comics were having trademark conflicts over the two characters. In 2012, DC finally made the change that I was wanting all along and renamed the character officially as Shazam. The iconic graphic novel Kingdom Come should be read if you want to see Shazam and a demonstration of his power. Kingdom Come is my favorite graphic novel of all time personally. But lately, DC has started changing little things about Shazam. They changed his costume in recent years to include a cloak. They also have more of his powers dealing with magic and lightning so they can differentiate between him and Superman better. His personality became more kidlike as well. It was like Shazam had almost a complete makeover. Shazam has never duplicated its success from the 1940s. DC will give the character a comic book series now and then or throw Shazam into the Justice League, but the demand must not have been overwhelming enough to give him a permanent comic book. 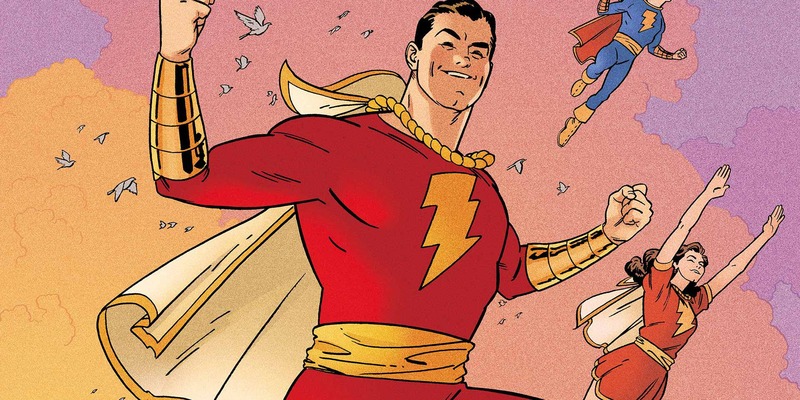 However, with a Shazam movie set to debut in 2019, who knows what is in store for the character. Zachary Levi is the actor portraying the legendary Shazam. Levi was not the obvious choice because he was of slight build, so it will be interesting to see how the CGI effects make up for it. I was in favor of giving the role to John Cena, the WWE wrestler that has a boyish quality to him and is starring in more and more films lately. But, alas, nobody asked for my opinion. Black Adam is one of Shazam’s main adversaries. In fact, Black Adam first had the powers of Shazam and was a superhero himself until he turned to the dark side. Of course, the backstory might change a bit now that there will be a film about Black Adam starring the hardest working man in show business, Dwayne “The Rock” Johnson. Perhaps with the films debuting soon, the Shazam family could be making their big awaited comeback into the upper echelon of comicdom.